Most gaming headphones are made by companies better known for video game gear than for audio equipment. Enter Sennheiser, recording industry stalwarts trusted by people who actually use headphones to listen to music. A few weeks ago someone from Sennheiser emailed asking if I’d like to check out their new PC 373D surround-sound gaming headphones. I’ve since put the headset through its paces over the course of a few weeks of regular video game playing. (Which, for me this time of year, means an exhaustive marathon of all kinds of games.) Here’s what I’ve found. The PC 373D headset costs $250 new, though you can usually find one for a little less. It’s a USB-only headset that is accompanied by a standalone PC app that handles 7.1 Dolby headphone surround, EQ settings, mic noise canceling and sidetone volume. You can use it as a USB mic on any hardware that’ll support that, but you can only get surround sound on PC with the app. The headset itself includes semi-open-back earcups and has a large boom mic that you can mute by flicking it up and un-mute by bringing it down to talk. A button near the base of the headphone’s USB cable lets you toggle Dolby headphone surround on and off. Let’s get to the goods and the bads. Good audio quality. 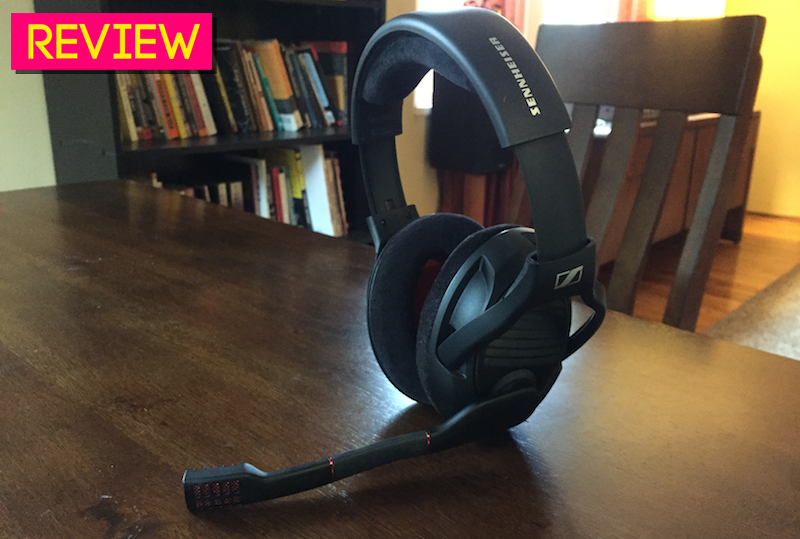 Lots of gaming headsets emphasize strong bass response, but these Sennheisers provide a more balanced sound field. The result is something that feels “closer” and more present than several other gaming headsets I’ve recently used. As I’ve gotten used to it I’ve come to like it. The PC 373D’s sound-field is less spread out than other headsets but cleaner as a result, particularly on the default neutral EQ setting. As is usually the case, the overall experience ultimately comes down to how the game is mixed: Dishonored 2 and Watch Dogs 2 both have some sound mixing peculiarities, while something straightforward like Doom hits hard and sounds strong and clean. Grand Theft Auto V’s immense surround-sound field is well mixed and consistent. At high volumes I occasionally get some rattle as the bass kicks in, but the speakers themselves have very little distortion. The app and custom EQ settings are disappointing (more on those in a bit), but in general, these headphones have clear sound quality, to the point that I’d consider using them for regular music listening. Very comfy. At first I found the PC 373D’s to be too snug, since they sit tighter on my head than my AKG 240 studio headphones and have smaller ear-cups than the older Astro A40s and A50s I usually use for games. Over time, however, I’ve grown to appreciate how “invisible” the headphones become after about five minutes of use. In fact, I’d go so far as to say these are among the most comfortable gaming headphones I’ve ever used. They’re semi-open-backed, so you can still hear sound from the outside world. That helps them feel more naturally comfortable, though the moment they start piping game audio, audio from the outside world vanishes. The velvet-ish ear cups and headband are very soft and haven’t grown less so over time. The headset is also relatively light—I’ve worn them for hours on end and have never felt any weight-related discomfort on the top of my head or around my ears. Nice-looking. This is a small thing, but the PC 373Ds have an understated look that I prefer to more garish, colorful gaming headsets. They’re entirely matte black with some subtle red highlights on the microphone and earpieces. No funky wires, no neon colors, and no corny logos. USB only. I’m a little bummed that the PC 373Ds only support USB audio. The USB cable does terminate in a removable analog plug running into the left earpiece, so it may well be possible to get an analog cable to swap in if you want to use the headset with an analog port. (I’ve asked Sennheiser PR for some clarification on this.) But out of the box, this is a USB headset only. They work fine as regular stereo USB headphones if you plug them into, say, a PS4, but they lack the ability to do headphone surround on anything but PC. Given how many gaming headsets double as ordinary analog headsets or accept a console’s optical audio output, it feels limiting for such a high-end piece of gear to only work via USB. Squished microphone signal. The PC 373D microphone sounds passable, but the audio is more squished and compressed than I’d like. The mic also defaults to being pretty close to my mouth, though I found I could bend the mic boom to get it far enough away that I didn’t have too much trouble with breathy plosives. Here’s a demo recording, with my Astro A40 mic included for a point of comparison. Like I said, it sounds fine, but considering the headset’s price I would’ve expected a clearer mic signal with more body. Limited EQ presets. The included app is simple and straightforward. That’s nice if you don’t want to feel overwhelmed by options, but it’s too bad that the headset only has three built-in EQ presets with no option for customization. I also didn’t really care for any of the built-in presets, and found that leaving them off gave me the fullest, best-sounding signal for games, media and music. Considering that this is a high-end headset from a well regarded audio company, I’m surprised at the paucity of software EQ options, particularly the fact that you can’t make your own EQ presets. Very expensive. With a list price of $250, the PC 373Ds are some of the most expensive gaming headphones I’ve reviewed. Their price seems particularly high given that they’re wired headphones and don’t offer compatibility with optical or analog inputs out of the box. High-end all-rounders in the $200-300 range generally offer more options, better console integration and wireless headphones. The PC 373D’s pleasing audio quality and comfort are both big points in its favor, but the price tag makes them much harder to recommend to most people. They’re plastic, and they will break. I include this warning in basically every gaming headset review I’ve ever written, but it’s as true as ever: The Sennheiser PC 373Ds are made of plastic, and they will eventually break. Maybe in three years, maybe in five. Maybe an earcup will snap off, or maybe the knob that controls the volume will fritz out. This headset’s plastic feels relatively sturdy, but don’t expect the sort of durability you’d get from headphones made using wire or vinyl parts. The Sennheiser PC 373Ds are nice-sounding, comfortable PC gaming headphones that cost about a hundred bucks more than most people are probably willing to pay. The headphones themselves are great, but considering their price I’m disappointed in the lack of analog support, bare-bones included software and overly compressed microphone. That being said, if your main priority is audio quality and money isn’t an object, you could definitely do worse.